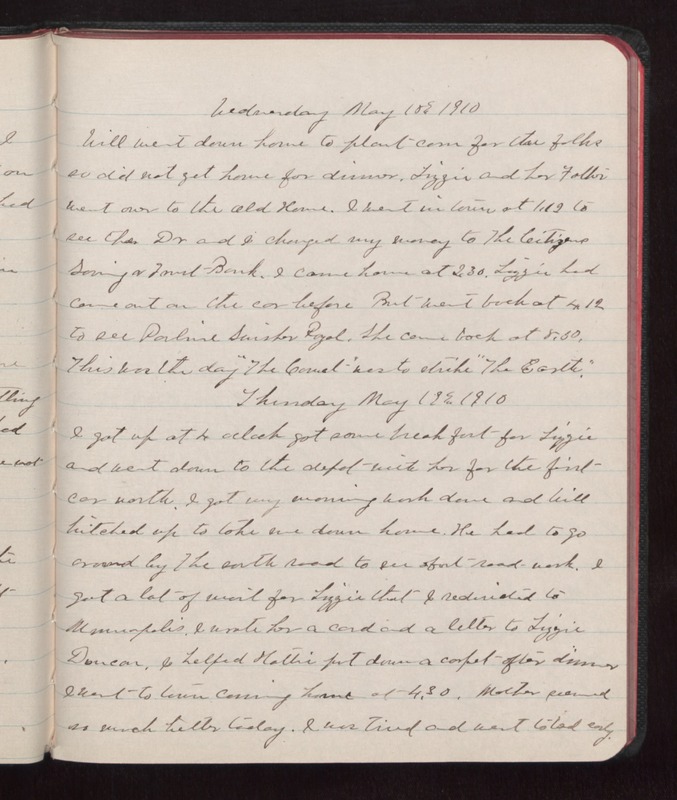 Wednesday May 18 1910 Will went down home to plant corn for the folks so did not get home for dinner. Lizzie and her Father went over to the old Home. I went in town at 1.12 to see the Dr and I charged my money to The Citizens Saving & Trust Bank. I came home at 2.30. Lizzie had come out on the car before But went back at 4.12 to see Pauline Swisher Royal. She came back at 8.30. This was the day "The Comet" was to strike "The Earth." Thursday May 19 1910 I got up at 4 oclock got some breakfast for Lizzie and went down to the depot with her for the first car north. I got my morning work done and Will hitched up to take me down home. He had to go around by the south road to see about road work. I got a lot of mail for Lizzie that I redirected to Minneapolis. I wrote her a card and a letter to Lizzie Duncan. I helped Hattie put down a carpet after dinner I went to town coming home at 4.30. Mother seemed so much better today. I was tired and went to bed early.